Southsea ferry port is 1 mile from Portsmouth in Hampshire and is the passenger gateway to Ryde on the Isle of Wight. 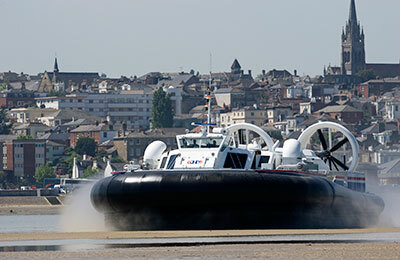 With a crossing time of just 10 minutes, Hovertravel operate up to 39 hovercraft crossing a day. Situated between Gosport and Hayling Island, Southsea lies on the edge of Portsmouth, a short distance from Portsmouth Historic Dockyard (home to the Mary Rose Museum and HMS Victory), the University of Portsmouth and Fratton Park Football Stadium. Hovertravel's Southsea "Hoverport" is just next to Clarence Pier - not to be confuse with South Parade Pier - with a car park just across the road, and public toilets available. Clarence Pier features an amusement arcade, fairground rides and a crazy golf course, along with fast food outlets and a coffee shop. Hovertravel offers the fastest way to cross the Solent between Southsea and Ryde on the Isle of Wight. The low tides at Ryde take the sea out far past the town's esplanade, making it impossible for any ship to berth so close to the town centre. The hovercraft however can travel at very low tides and so in 1965 Hovertravel was established, and more than 29 million passengers have travelled on the service since then. Today, Hovertravel run two hovercraft, for foot passengers only, with a journey time of just under 10 minutes. For those of you who want to take the car, the Wightlink ferries terminal, which also runs to Ryde on the Isle of Wight is just over a mile away, close to the iconic Spinnaker Tower, about half an hour's walk from the hovercraft terminal. Leave the train at Portsmouth & Southsea Station and follow signs to the Hoverbus - bus stop C. See below for details of the Hoverbus service.